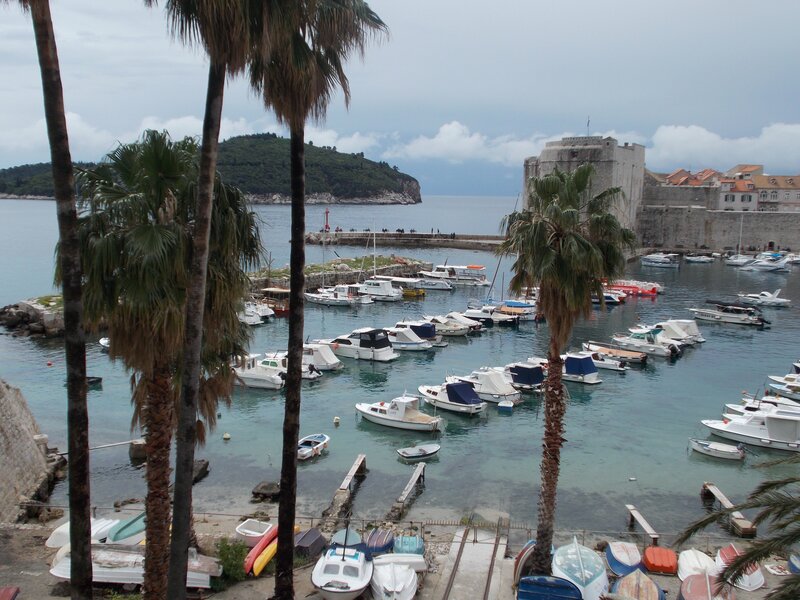 I boarded the MS Vapor in Dubrovnik for a Croatia small ship cruise. 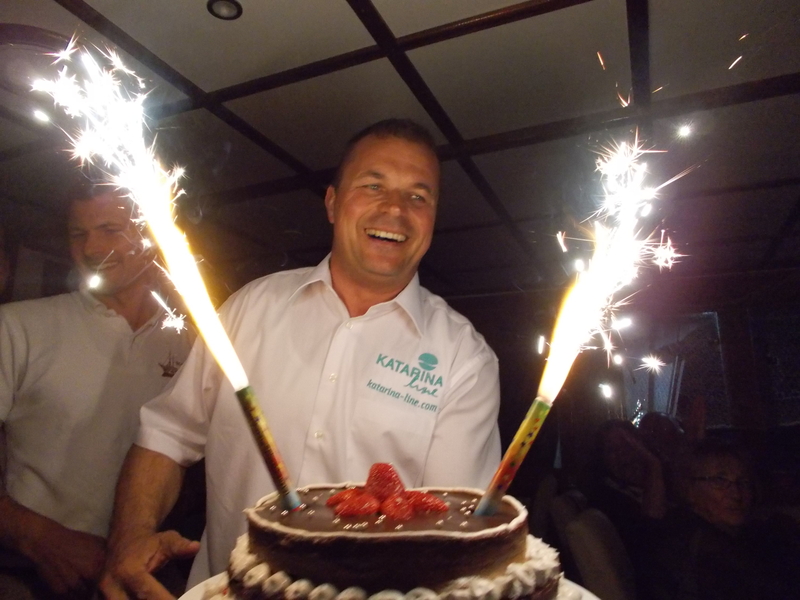 I was welcomed aboard by a Katarina Line representative and our onboard trip coordinator. Passengers had the afternoon free to explore Dubrovnik and return to spend the night onboard. After breakfast we had three additional hours in Dubrovnik before setting sail for our first port at noon. The Vapor has 18 cabins and sleeps 36. My cabin was small but made excellent use of every bit of space. 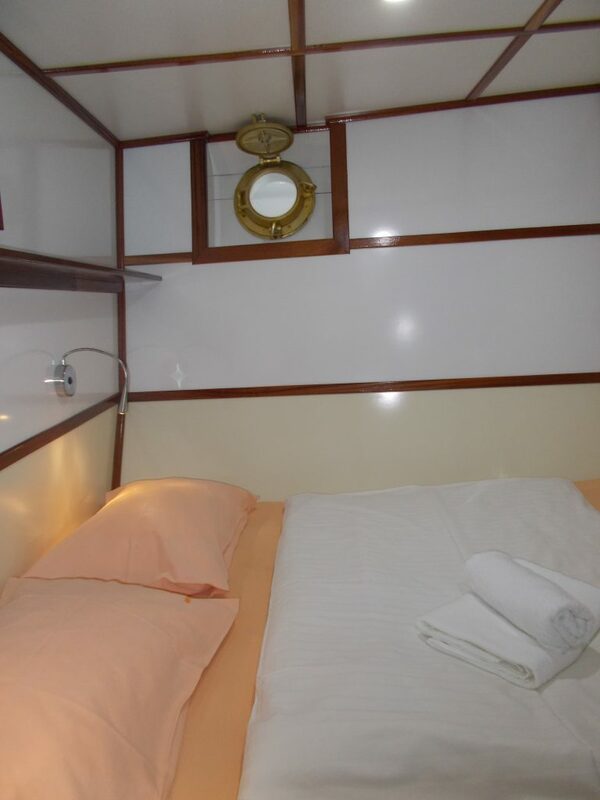 There was a closet, night stand, shelves and double bed in the main part of the cabin. A door leads to a bathroom with sink, toilet and a full size walk-in shower. This well designed cabin made a comfortable home for the next five days. 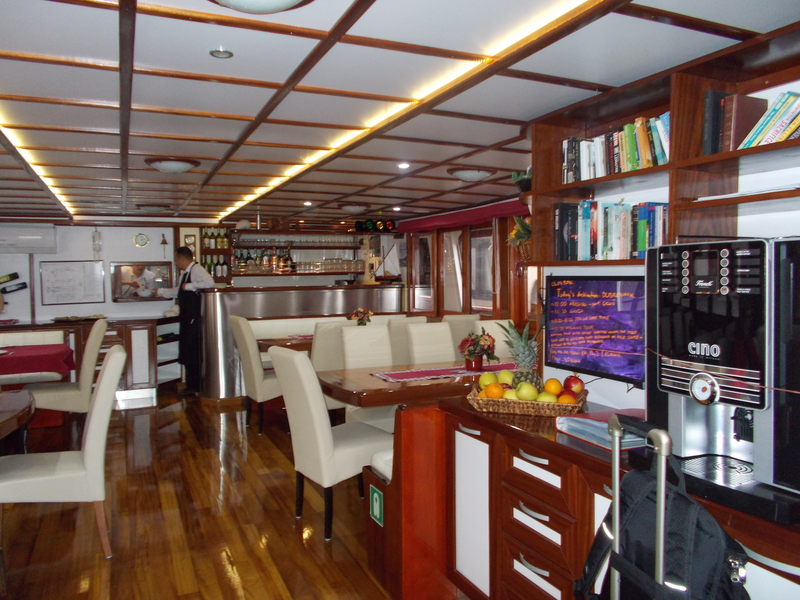 The dining area is on the main deck of the Vapor with family style seating for meals. Outside of the dining area is a protected seating area with tables. Up one small flight of stairs is an open deck with seating for about ten people and up one more flight of stairs is a large sun deck with more seating. The captain and crew made everyone feel welcome. One of the crew members was the captain’s son. 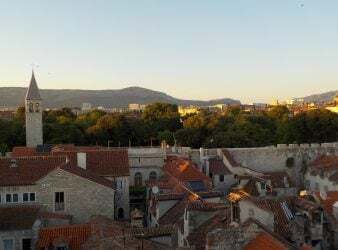 The friendliness of the crew along with the intimate size of the Vapor made me feel more like I was setting sail on a private boat with friends than a Croatia small ship cruise with Katarina Line. Each day our agenda was posted on a board in the dining area. 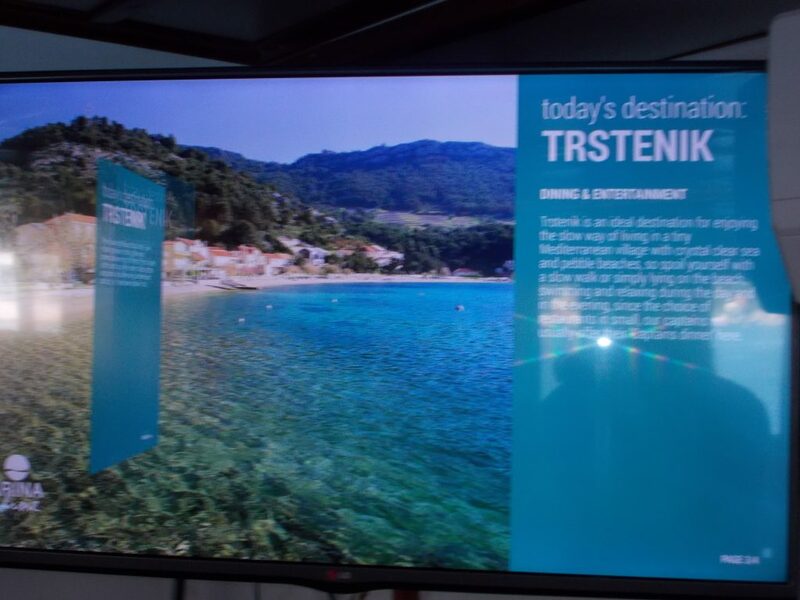 There was also a slide show with facts about our next stop. 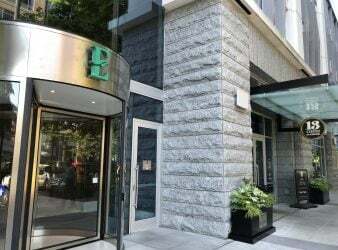 Breakfast and lunch are included every day along with afternoon tea and cookies. Passengers are on their own for dinner with the exception of the Captain’s dinner. Most passengers chose to leave the ship and eat dinner in the small towns where we docked each night. Every meal impressed me with how the crew was able to put together such an extensive menu in their very small quarters. 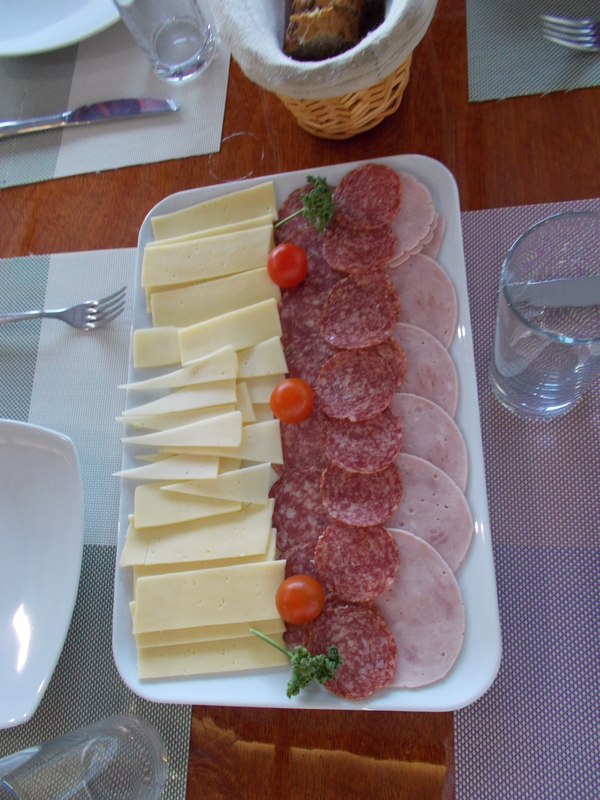 Breakfast included cured meats, cheeses, fresh bread, yogurt, cereal and a buffet selection of hot eggs, breakfast meats and potatoes. The first lunch was a real surprise to me. I was expecting cold cuts or sandwiches. 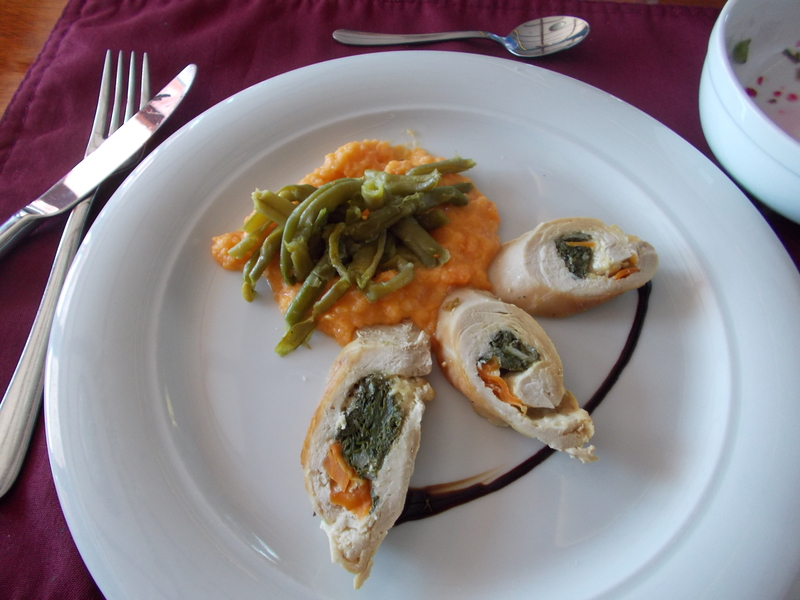 However every lunch was a three course meal of tasty hot food, usually served while sailing to our next port. 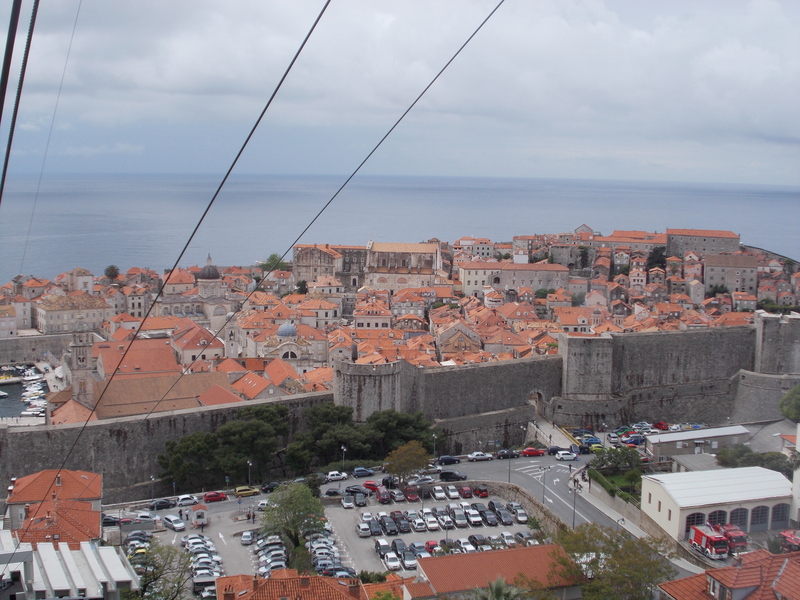 After an early morning breakfast I took the bus in to Dubrovnik for a quick cable car ride. 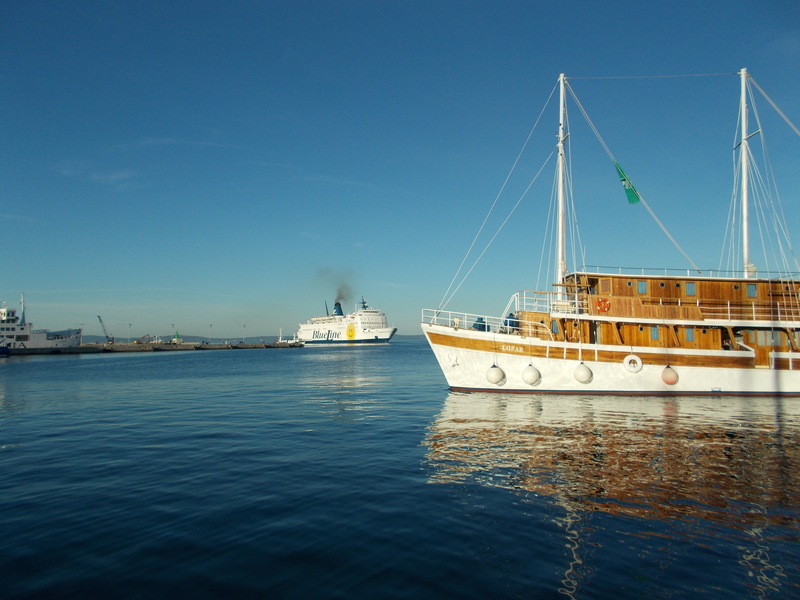 All passengers were on board by noon and ready to sail towards our first destination of Trstenik. We all sat on the deck for our first sail. It was sunny with a cold wind blowing. 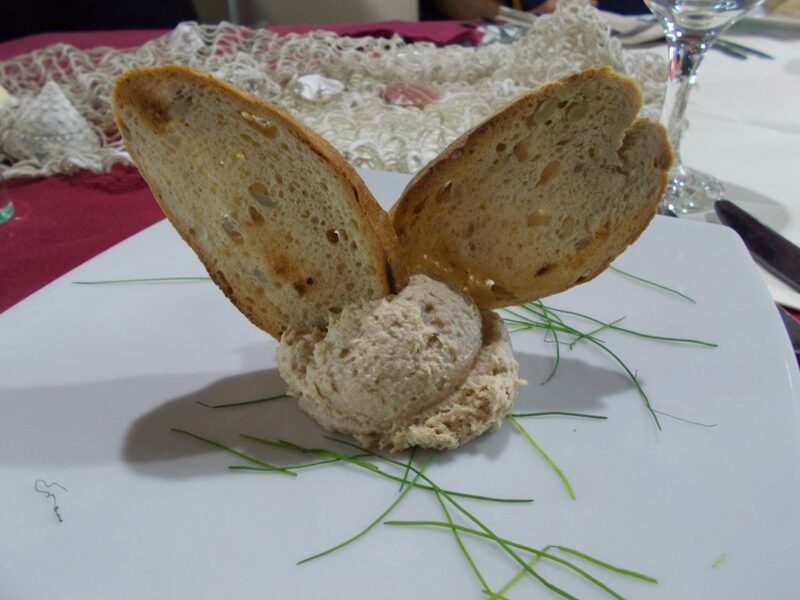 At 1pm we gathered in the dining area for our fist lunch of soup, chicken roulade and an unusual dessert made of whipped cream, champagne and ice cream mixed together with sliced almonds. The combination provided each bite with something sweet, smooth, crunchy and delicious! The weather was a little cool for swimming but three brave souls took a quick dip in the early afternoon. 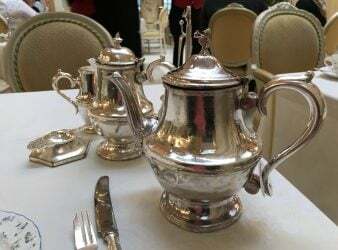 As they were every afternoon, whether sailing or in port, tea and coffee were served with fruit and cookies at 4pm. 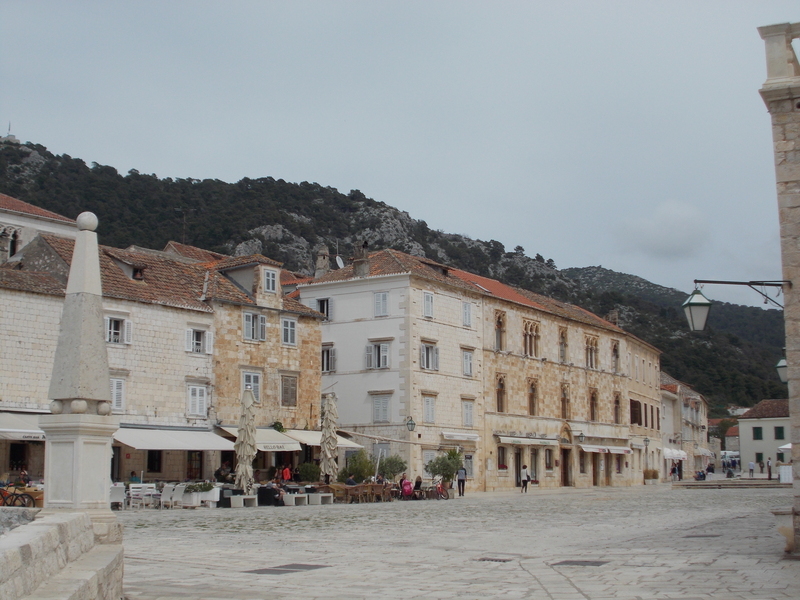 We arrived at Trstenik about 5pm after a gorgeous afternoon sail through inlets and tree covered coastline. Trstenik is an almost deserted town of about 160 inhabitants after fires destroyed the vineyards on the surrounding hillsides a few years ago. The Vapor continues to stop here to provide a little business to the local bar and small store. 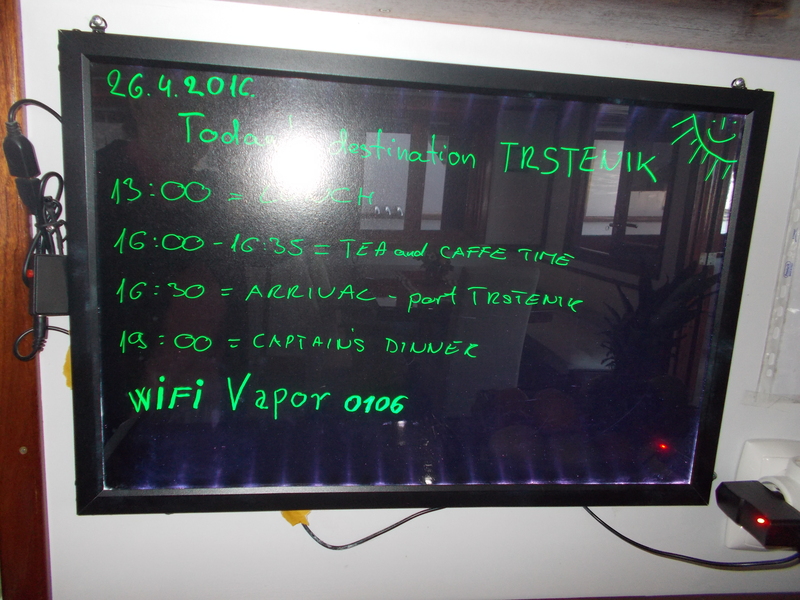 Because there are really no choices for places to eat in Trstenik, the Captain’s dinner was scheduled for this night. 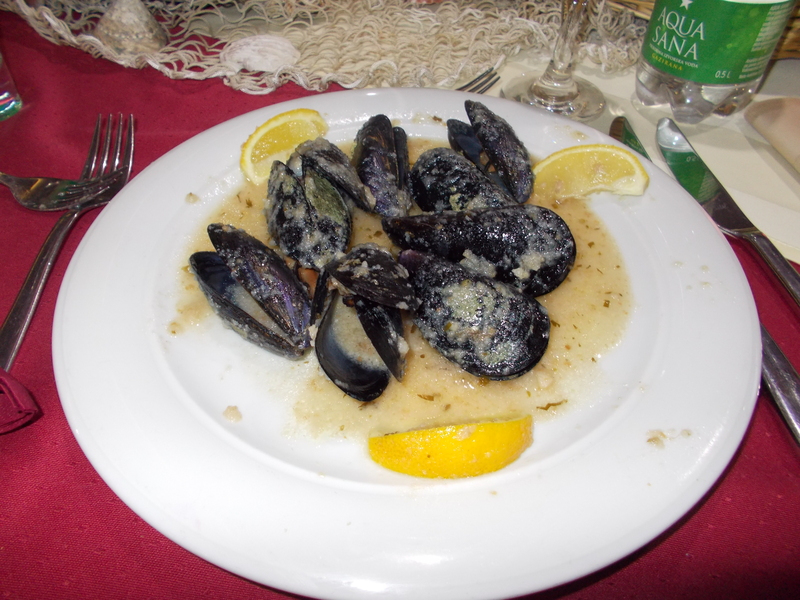 So after a walk along the small seafront and glasses of wine at the local bar we returned to ship for dinner. 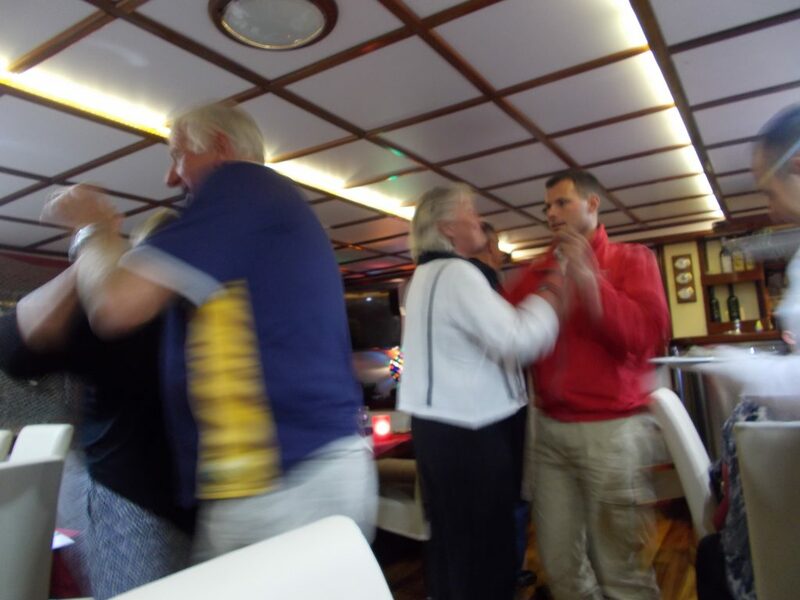 After dinner the crew entertained the passengers, the passengers entertained the crew and there was much dancing, singing and laughing until time for bed. Breakfast was at 8am and we departed for the island of Korcula at 10am where we were scheduled for an afternoon tour with a local guide. This was our only day of really rough seas while sailing. We were all a little green as we staked out a spot on the ship and kept our eyes on the horizon. 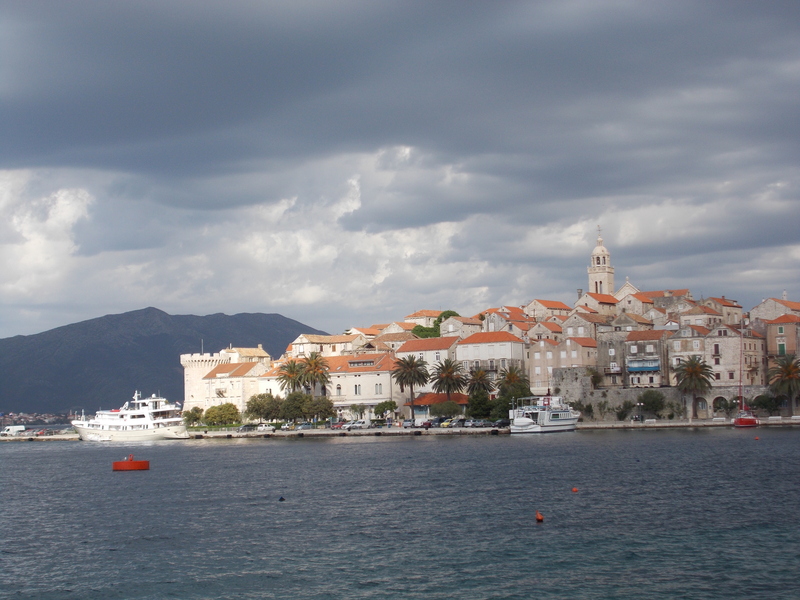 We arrived at Korcula at 11:45am as it was too choppy to stop for a swim along the way. 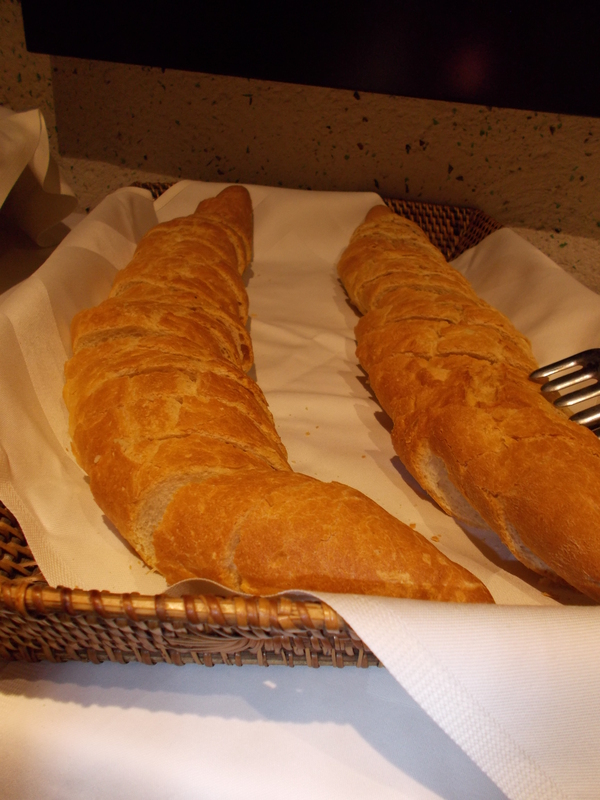 Most of us got off of the ship for a stroll around town before returning to the ship for another great lunch – tomato rice soup, fresh bread, a selection of salads, two risottos and ice cream sundaes for dessert! 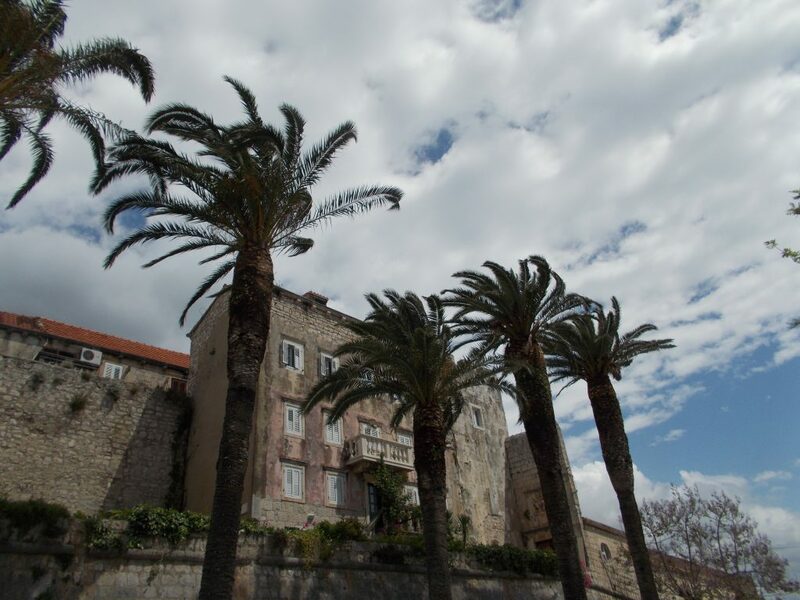 A local guide filled us in on the history of Korcula, supposedly once the home of explorer Marco Polo, while orienting us to its charming old town and newer port area. As with everywhere I visited on my Croatia trip Korcula has a rich history going back thousands of years. 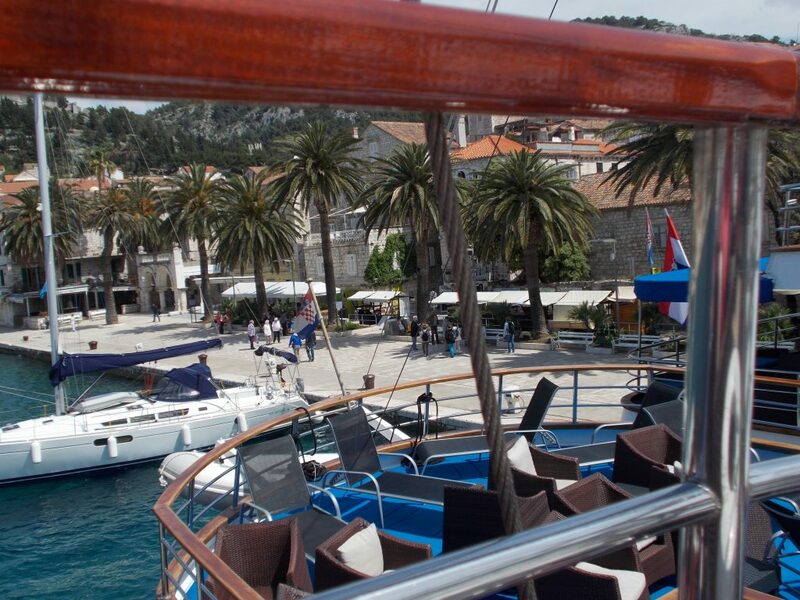 There is no connection to mainland Croatia from Korcula so residents must use the ferry to leave the island. After our tour many of us took some time to explore on our own. Many passengers had dinner in town and a few of us spent the evening on the ship reading and visiting. We were fortunate to be a very congenial group on this cruise with passengers from many countries spanning a wide age range. 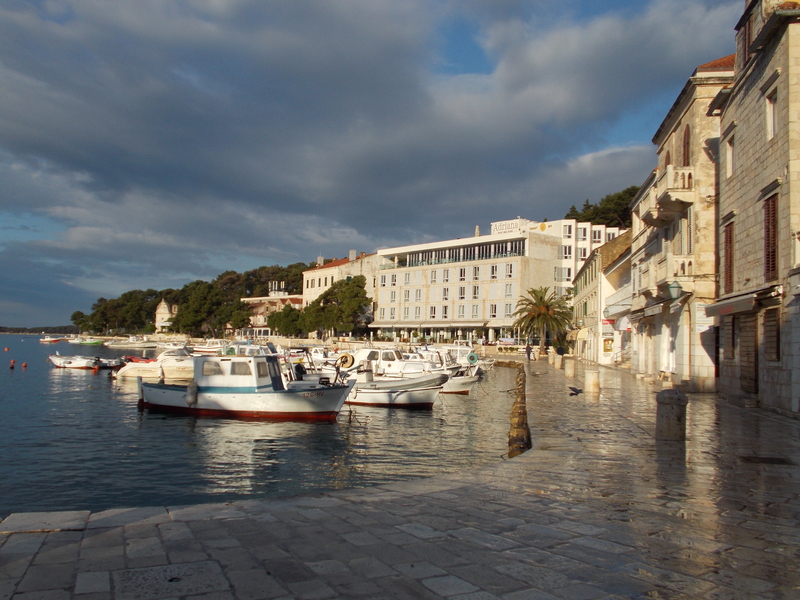 The next morning we set sail for Hvar as we ate breakfast. We had lunch on board while sailing and arrived in time for a 2pm tour. 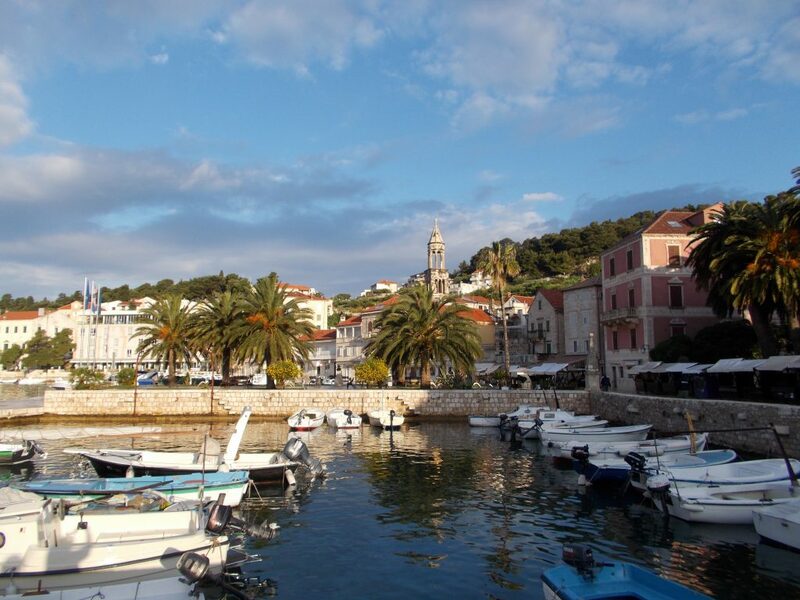 Hvar is the largest inhabited Croatian island and was under Venetian rule from the 13th to 17th centuries. Roman ruins are still being discovered on the island which is known for olive oil, wine, lavender and tourists. The captain set out an olive oil and balsamic vinegar tasting on deck late afternoon. 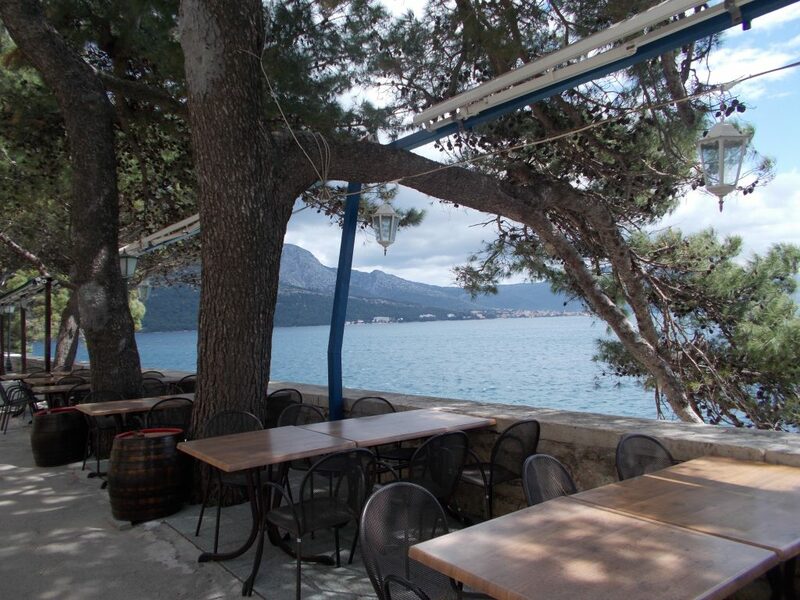 The oils and vinegars were all made from produce from Captain Zoran’s garden. 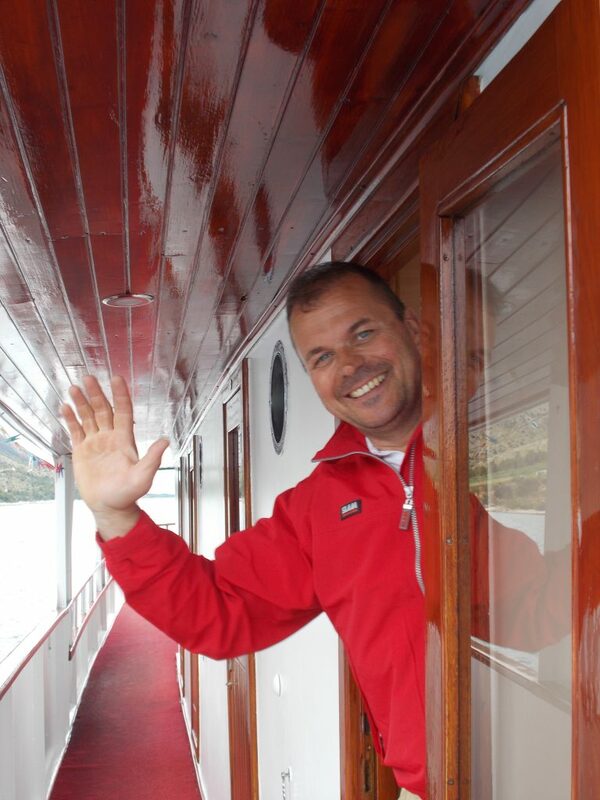 While many went out for dinner in Hvar I read on deck and wrote notes of the day’s activities. I was up early the next morning so took a short walk in the morning light just after a hard rain. It was a beautiful time of day to see the island. 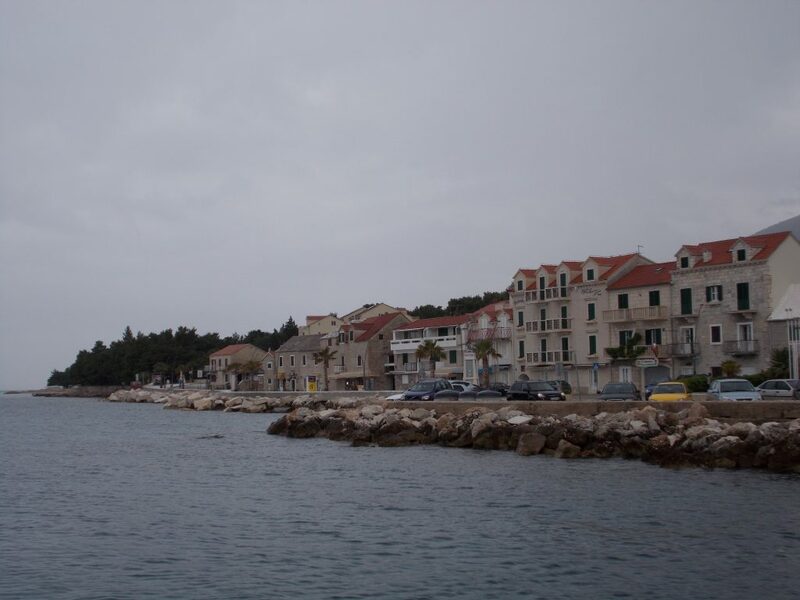 Shortly after my return we set sail for Bol, where we were stopping on route to Split, our final destination for the day. The rain was coming down full force when we docked at Bol but many of us made a run for it and grabbed seats at whichever cafes had some cover. 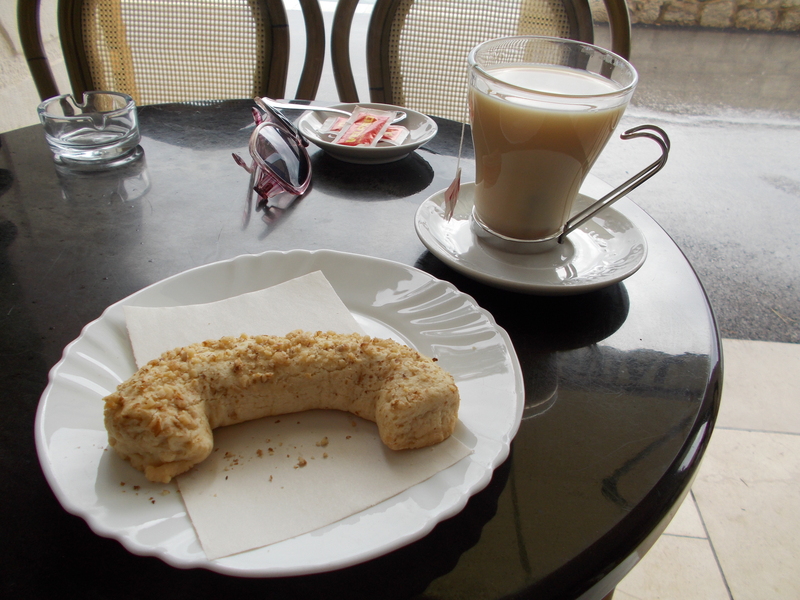 I was lucky to find a café with an awning and no people where I could sit out the rain. The sun appeared after about 30 minutes. 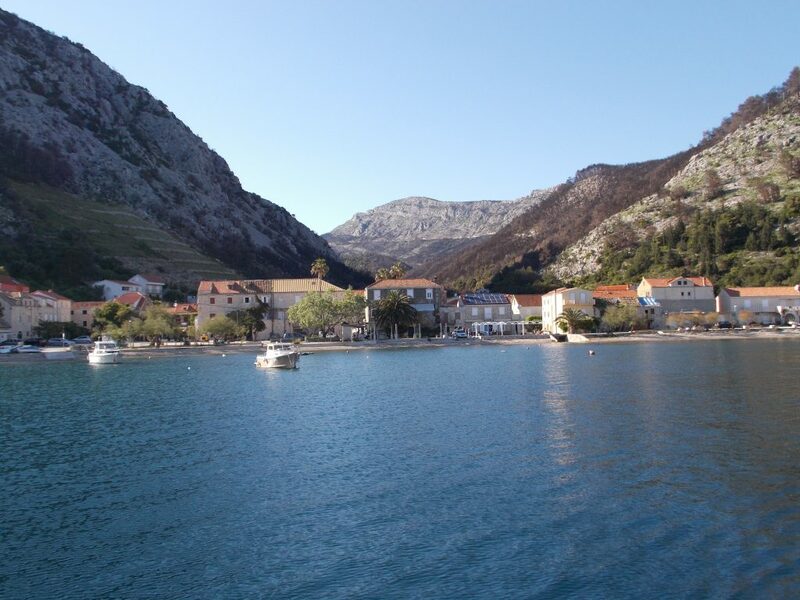 The town of Bol is a charming community with ferries and catamarans coming and going with people from nearby islands. 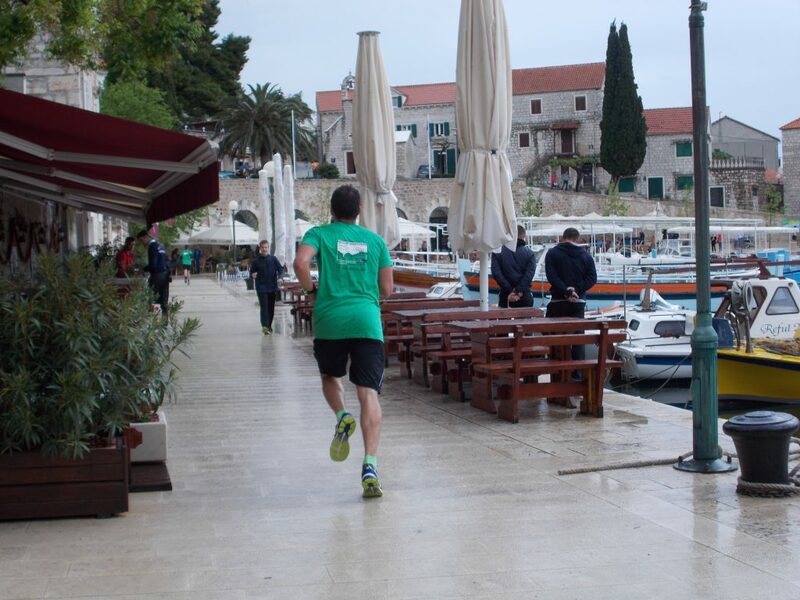 Bol was hosting a local marathon that day with runners in several age groups. The community spirit was contagious and I was soon cheering on the participants. 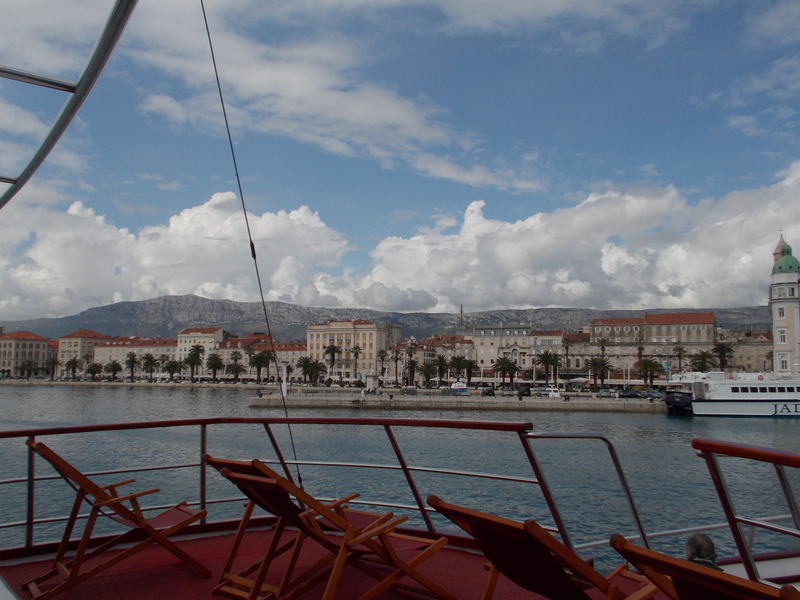 At noon we resumed our sail towards Split just as the rain started again. A hot lunch was a great way to pass the time on board during the rain. The sun and Split appeared at about the same time. 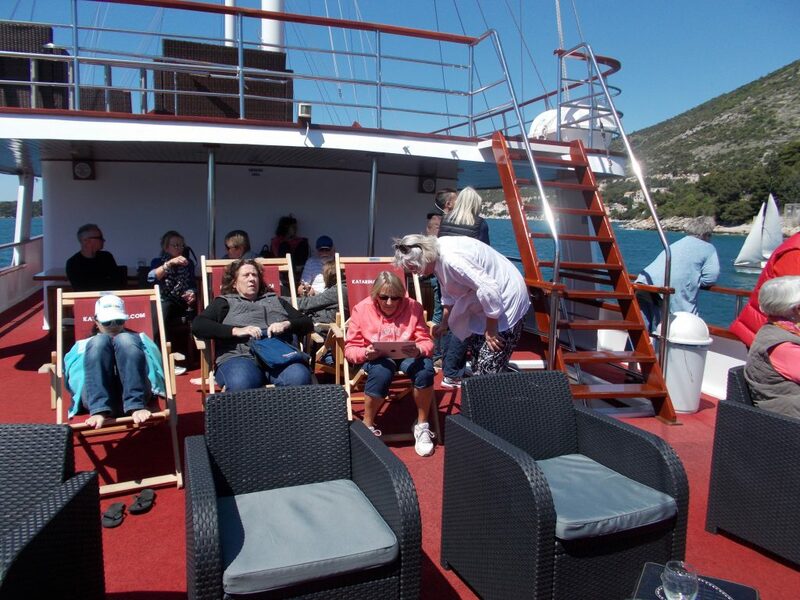 We gathered on deck to watch our arrival at the last port of call for our Croatia small ship cruise. 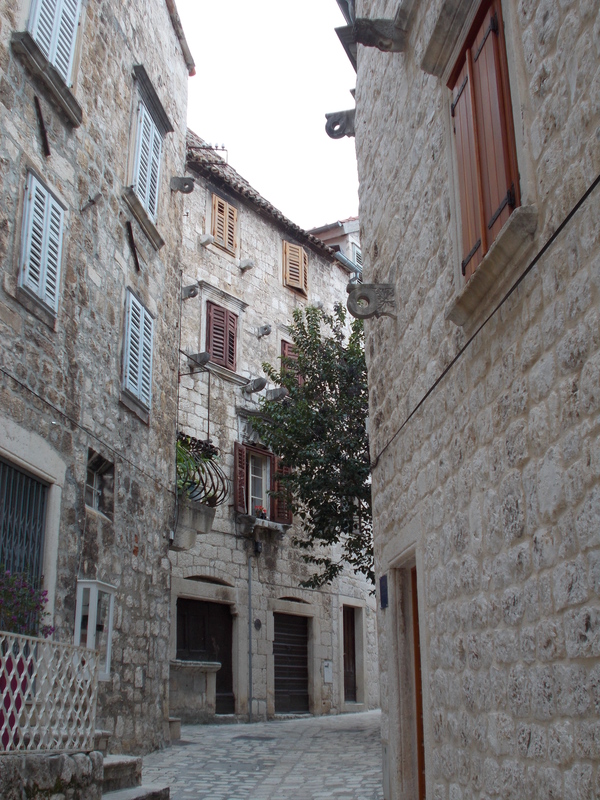 Some passengers toured Split and the Diocletian Palace with a local guide. 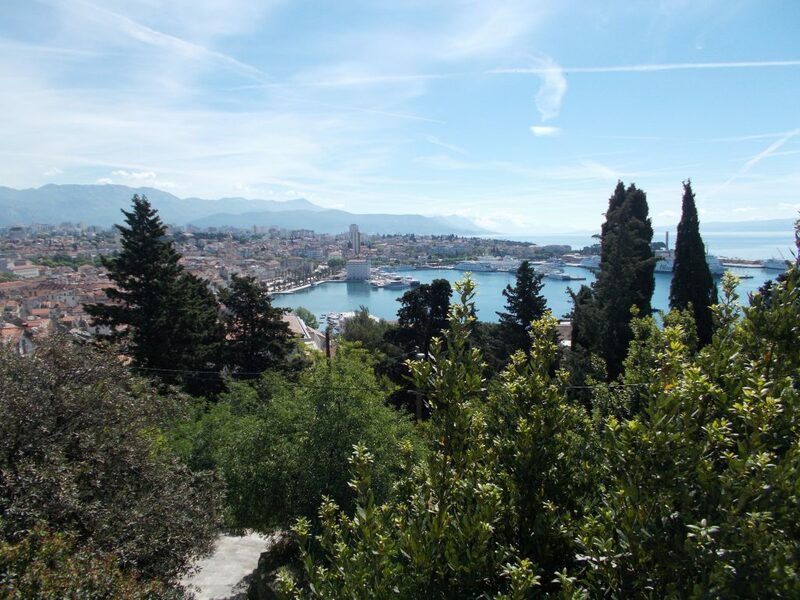 I had taken a tour on my stop in Split the previous week on my nine day land tour with Katarina Line. So I hiked up the hill to Marjan Forest for a spectacular view of the city. An evening stroll along the waterfront and it was time to tuck myself in for one last night in my cozy cabin. After an early breakfast onboard I bid good bye to the crew and my fellow passengers as the ship needed to be cleaned, restocked and made ready for a new sailing that afternoon. The cruise lived up to all of my expectations. The ship was small and intimate and yet I never felt claustrophobic surrounded by the stunning blue sea and sky. The crew were attentive and friendly. I did find that when we were docked tandem at some ports the gangway from ship to ship felt a little insecure. However a crew member was always available to help. 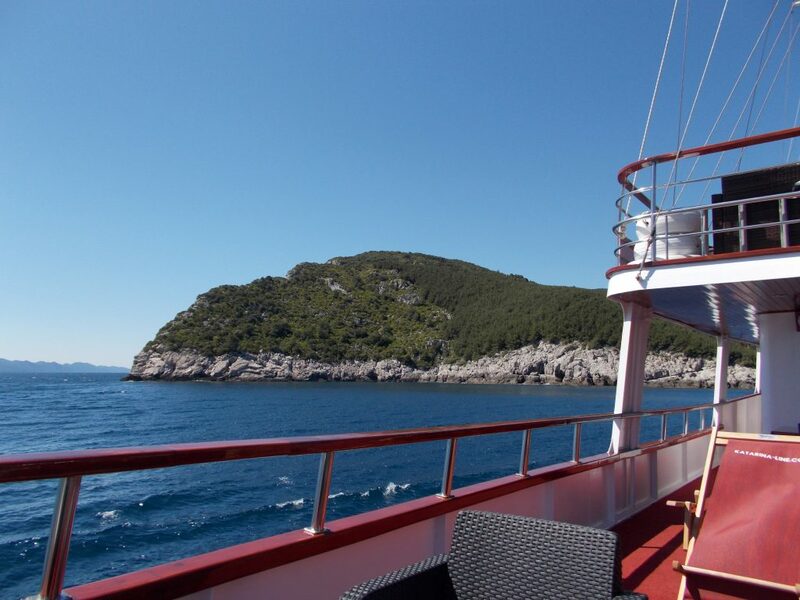 If you are looking for an affordable, casual, intimate look at the islands of the Adriatic with an attentive crew, good food and time to explore on your own, try a Croatia small ship cruise with Katarina Line. 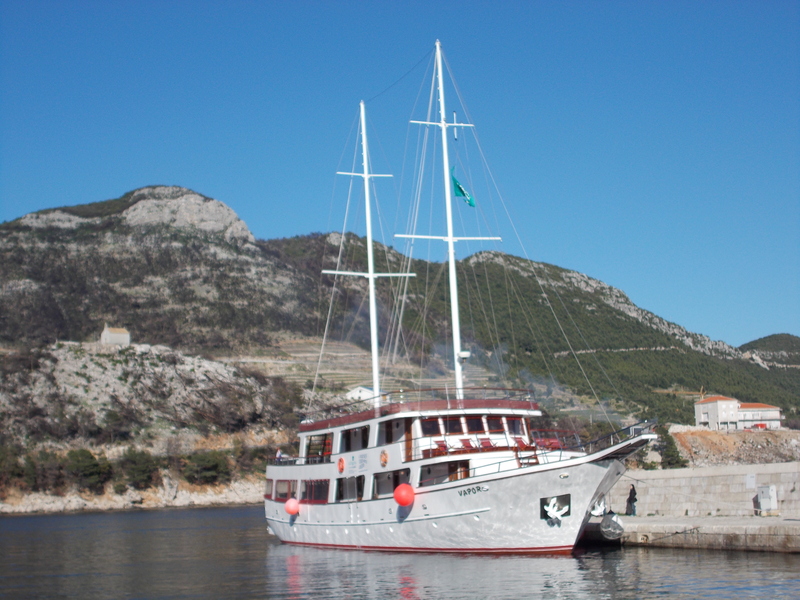 You can also rent a boat for Croatia island hopping and enjoy perfect sailing vacation.